Mawlynnong, nestled in the pristine hill state of Meghalaya is along the Indo-Bangla border. This cute and colourful little village is renowned for its cleanliness. The village is a picture perfect painting. The village is situated about 75 kilometres from Shillong. The main occupation of the villagers is agriculture. They mostly grow areca nut. About 82 households live in Mawlynnong. Keeping the surrounding environment clean is an age old tradition. Discover India magazine declared the village was the cleanest in Asia in 2003. 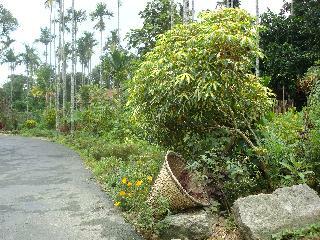 A dustbin made out of bamboo is found all along the village. Every one makes it a point that dirt and waste are not thrown anywhere. All the waste from the dustbin is collected and kept in a pit, which the villagers use it as manure. The villagers are now on a mission to ban plastic. What do we have to say? In these cities, there has been several government sponsored cleanliness drives meant to keep the surrounding clean. Yet, the rivers and streams in these areas are polluted to the level of having become unfit for use by humans. Mawlynnong's fame is now drawing an endless stream of guests from across the country and abroad. Although residential facilities are still scarce and are in the process of being developed, the existing one constructed from bamboo and thatch is quite hospitable and restful. Mawlynnong is an artist's delight and the sort of getaway that would titillate creative writers and poets, no less than it would attract serious researchers wanting to find No wonder, with such high degree of cleanliness and environment friendliness, the people of the village are all healthy and sprightly. Will ever Shillong or any other states in North East learn to follow the footsteps of Mawlynnong?